You create a fee, the details of which determine how it applies to student accounts. 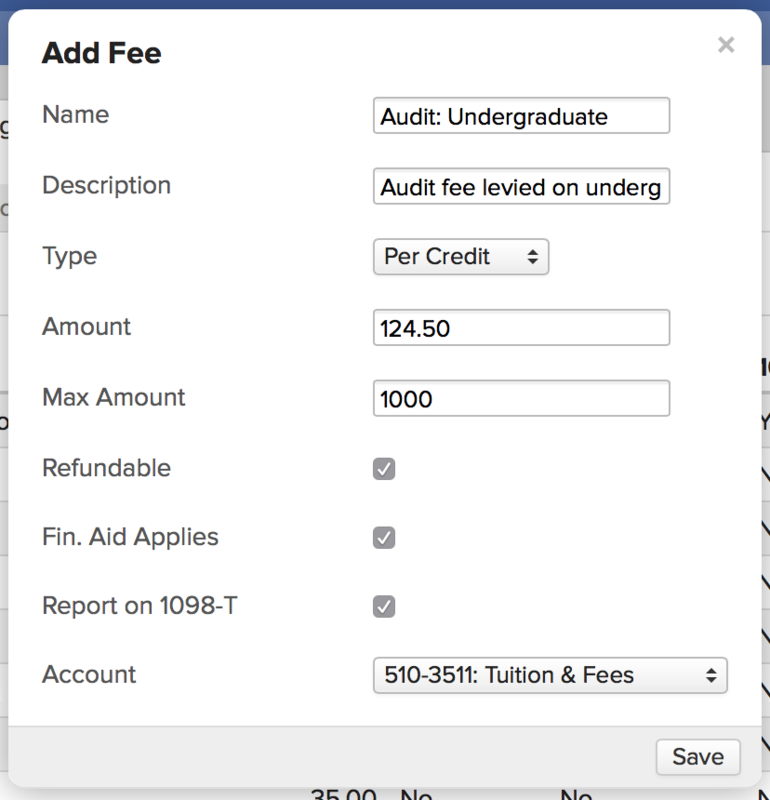 You can add optional fee rules, which let you automate the application of the fee when certain criteria are met. The fee is added as a pending charge to a student's account—whether because it was triggered by a Fee Rule or it is manually-added. Finally, the fee is invoiced. To set up a new fee, start by going to Billing > Settings > Fees. Flat Rate charges the same amount regardless of other factors. Per Credit/Hour/Course multiplies the fee amount for each unit or course in which a student enrolls in a given term. Enter the fee's amount. If you wish to create a credit, you can enter a negative number in this field (e.g. "-100"). Check if the fee is to be refundable, whether financial aid applies to it, and if it should be reported on IRS 1098-Ts. Select an account for the new fee. Most regular fees will be tied to an income account. Liability accounts can be used for deposits or for items you'll need to pay out later—like sales tax. If you choose a liability account, check whether this fee should be a deposit. For Audit Fees, follow the instructions in this article. If you let students charge Bookstore Tax or Bookstore Shipping fees to their accounts, set the Type to Flat Rate, and enter an Amount of 0. Deposits require a liability account. For application fees, follow the instructions in this article. For library fees (late fines and lost resource charges), see this article. Fee rules trigger the addition of a fee when the student meets certain enrollment conditions. For example, you could set up a Lab Fee that applies to all students taking a science course, or a Materials Fee for students pursuing studio art degrees. Fee rules are added in rule groups. Each group specifies a set of rules that must be satisfied by a particular enrollment in order to trigger the fee. In the above example, the two large grey blocks are both rule groups. Rule groups let you choose whether to trigger the fee if the student meets any of the conditions or all of them. Trigger this fee if the student is in the Undergraduate program, is enrolled in a total number of credits between 1 and 18 AND is enrolled in courses at either the Portland or Online campuses. They're best used in conjunction with another fee rule like Campus or Delivery Method. Matching rules trigger fees based on enrollment in courses that match all of the remaining rules. If a student enrolls in fifteen credits, four of which are courses with the Online delivery method, he'll be charged $200. This fee is only looking for credits that match the Delivery Method rule. If a student enrolls in ten credits, eight of which are courses with the Online delivery method, she'll be charged $300. This fee maxes out at six credits' worth of enrollment in Online courses. If a student enrolls in fifteen credits, four of which are courses with the Online delivery method, he'll be charged $750. This fee charges per-credit based on total enrollment; if the student takes any Online courses, he'll be charged for every credit he's enrolled in, regardless of delivery method. If a student enrolls in twenty credits, eight of which are courses with the Online delivery method, she'll be charged $800. This fee maxes out at 16 credits enrollment. To add fee rules, start by clicking edit. Select whether this fee will be triggered by any or all of the rules in this group. All Enrolled Credits/Hours/Clinical Hours ask you for a range indicating the total number of units attempted in a given academic term (see above). Enrolled Credits/Hours/Clinical Hours Matching Group Rules ask you for a range indicating the units attempted that match the other conditions in the rule group (see above). Enrollment rules ask whether this fee should trigger when a student enrolls in an individual course, or in any of the courses listed in a particular Course Group. Audit asks whether this fee should trigger when a student audits individual courses, course groups, or any course. Read more about setting up audit fees. Degree and Specialization rules trigger the fee when a student begins pursuing a particular degree or major/minor AND is enrolled in at least one course. Campus rules restrict the fee to students attached to particular campuses who enroll in courses on those campuses. Course delivery method rules apply the fee to students who enroll in a course with that method listed. Tuition Schedule and Room/Meal Plan rules trigger the fee when the student has that schedule or boarding plan and enrolls in a course. Custom Info rules affect the fee when a student's enrollment changes—not when the custom info field changes. Term Name rules trigger the fee when a student enrolls in a course in a term with a matching name. For example, enter "Fall" to trigger this fee only in the Fall Term of each academic year. Student Program rules restrict the fee to students in that particular academic program who enroll in a course in that same program. If you don't add a Program rule, then the fee can apply to any student in any program. Click add rule to open a new rule field. Click X to delete a rule. When you're finished, click Save. These fee rules will trigger the fee for future enrollments; they are not retroactive. How do I process deposits?